Simostronomy: Gomez's Hamburger- Want Fries With That? Gomez's Hamburger- Want Fries With That? While scanning the pre-print archives on astro-ph I came across this strange topic, The physical conditions in Gomez's Hamburger (IRAS 18059-3211), a pre-MS rotating disk. The title jumped out at me. In amongst all the other typical astrophysical topics that show up each day, you rarely see fast food references, and I had to chuckle to myself at the thought of a 'pre-MS' rotating disk. What is this, some kind of cranky hormonal celestial oddity? After reading this paper, and several others, the interesting story of Gomez's Hamburger came to light. This story also illustrates how some things can be more confusing than they have to be, because of the names we apply to them, and then keep, long after we realize the true nature of the beasts. Gomez's Hamburger was discovered in 1985, by Arturo Gomez, a support technical staff member at Cerro Tololo Inter-American Observatory. The reason it was named Gomez's Hamburger becomes pretty obvious, once you've seen a picture. 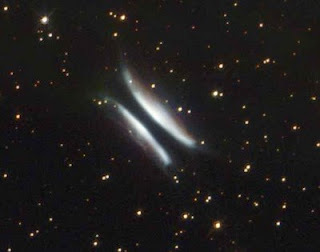 Initially, astronomers thought this was a protoplanetary nebula. Planetary nebulae are nebulae formed from material shed from a highly evolved (old) star as the hydrogen in its core is nearly all fused to helium. The eventual end result is a hot white dwarf, the remaining ash from the core of the original star, surrounded by gas glowing from the high temperature of the white dwarf in the center. Planetary nebula have nothing to do with planets. They were originally called this because many of them look very non-starlike when observed visually in telescopes. Some even look quite round and can even have a bluish or greenish color to them. You've probably seen marvelous color images of planetary nebula like the Cat's Eye Nebula in Draco. Trust me, in a small telescope they don't look anything like this. A protoplanetary nebula is what we would call a star and the surrounding gas in the early stages of becoming a planetary nebula. So, in essence, astronomers believed they had found an old evolving star in the process of forming a planetary nebula. The lighter areas (the buns) were explained as gas glowing from the light of the central star. The dark portion (the hamburger) was thought to be a thick disk of dust that obscured the light from the central star buried in its depths. Fast forward a few years, and evidence now indicates Gomez's Hamburger is a protoplanetary disk. Protoplanetary disks are all about planets! They are the dust and debris left over after a star has newly formed and begun to burn hydrogen in its core. This cosmic debris is the material that eventually coalesces into planets, asteroids, comets and the other stuff that eventually becomes a planetary system around a star. Talk about an about face! Instead of a star nearing the end of its life cycle, it is more likely that Gomez's Hamburger is a baby star just settling down for a long life on the main sequence. (By the way, that is what was meant by a pre-MS in the title of the paper that started me on all this. Pre-MS = pre-main sequence.) Not only that, but because of this new perspective, astronomers have determined that Gomez's Hamburger is actually much closer than we originally calculated. If it had been a typical planetary nebula, its distance from us would be on the order of 6500 light years away. As a much cooler protoplanetary disk, the new estimate for its distance is about 2000 light years away. The paper I referred to in the first paragraph describes this group of astronomers' observations, conclusions and discussion of the details of what is going on, in and around this newly formed star. The star at the heart of Gomez's Hamburger is probably somewhere in the range of 2-3 times the mass of our Sun. We can't definitively rule out the possibility that it is two stars, a binary pair in the middle. The hamburger is relatively cool gas and dust rotating around the central star. The brighter parts, the buns, are relatively thinner gases at higher temperatures, glowing from the energy released by the star and all this rotation and friction. Even more interesting is the fact that these astronomers have found a blob of material inside the cooler disk that could be a protoplanet several times the mass of Jupiter. Gomez's Hamburger is a young star with planets forming around it just as we predict planets form around stars! The terminology is still a confusing mess. The 'burger' has gone from a protoplanetary nebula, which has nothing to do with planets, to a protoplanetary disk, which has everything to do with planets. No wonder some people think its hard to teach or understand astronomy. All I know is, I have an insane craving for a hamburger, some fries and a chocolate shake! I like your comment on the strange naming of things in astronomy. Perhaps it is because it is the oldest discipline in science, or perhaps it is because Professors enjoy torturing all their young students. Either way, my current experiences as an undergrad astronomy student have left the impression that most of my learning efforts will be put towards deciphering the cryptic units and naming conventions used in astronomy. This is EXTREMELY reinforced in the software we use (i.e. AIPS - dear God do I loathe that program's antiquity). It's interesting to think about how the field would be organized if the students were put in charge. Oh well. I suppose this is the small penance we must pay. In return we get to study the stars! Surely a trade worth making. Yea, nomenclature and the naming conventions are a mixed bag of old archaic names and new scientific acronyms.